A very funny movie that takes the premise of Rear Window, about suspicious neighbors, and runs with it. A funny and also kind of creepy movie, this one is about strange neighbors who are up to something and the guys on the block who suspect them. Tom Hanks plays Ray, a married man who is the most down to earth of the locals. Yet he’s the one who is most suspicous, or at least the first to recognize that something’s going on. That’s because he lives right next door to these guys. What ensues as he rounds up a group of four friends to pursue the mystery, turns out to be a lot of fun. Sometimes the jokes are too silly and sometimes the scenes are too strange, but for the most part, this is a clever and fun time. 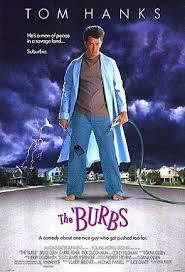 The Burbs is a funny and strange black comedy. It’s a movie about not trusting your neighbors and being convinced that they are killers of some kind or another. There have been plenty of movies like this before, from rear window to fright night, (where the neighbor was a vampire.) both of those films even have modern remakes (the Rear Window remake of sorts is called Disturbia.) but The Burbs is something different. 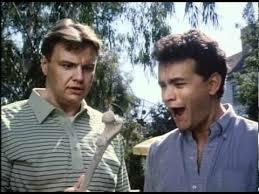 Unlike those other films, which are pure thriller, The Burbs is definitely a comedy. It’s about a guy who is strung out and losing his grip on reality because of how obsessed her gets over figuring out what the neighbors are all about. Tom hanks are the perfect actor to play this part. Hanks plays Ray, a married man who is suspicious that something is going on in the house next door. These suspicions are made clear to us from the very start of the film. That’s when we see Ray walking around outside at night, seeing the lights on, in the basement of his neighbors house, and hearing the crazy noises. The fact that this movie gets things started right away is a sign that it’s super ambitious and not wasting any time. The next morning is when we get to meet all of the people who live on the block. There’s Rumsfield (Bruce Dern), an older man who used to be in the army and has a much younger wife. Then there’s Art Weingartner, the local goofball, who is even more paranoid about what’s going on in that house than Ray is. This guy is the crazy one of the bunch. There’s also Ricky Butler, a teenager in the area, played by Corey Feldman, and than an old man named Walter, who lives at the end of the block. Walter let’s his little dog run onto other people’s yards and poop there. Rumsefield finds this out the hard way, and isn’t very happy about it. It’s during this first day that Ray and art are standing around, chatting about the neighbors, when one of those neighbors comes outside. Now this is the first time anyone is laying eyes on them, and the neighbor is young, wearing a thick beard, overalls, and looking like a hick from the country. The kid steps out onto the porch, takes a quick look around at the people standing in the street or in their yards, staring at him, and then goes back into his house. Once he’s gone, Ray and art start daring each other to go over, ring the doorbell, and introduce themselves. Neither one wants to accept the challenge. That night, what was the bantering of just two guys turns into a group of four. Now Rumsfield and Ricky join Ray and art. The four boys watch the neighbor’s house closely and discuss their observations. At one point, a neighbor comes out with a bag of garbage (the way he comes out, driving his car from the garage, dropping the garbage off, and then reversing the car to put it back, is very strange.) when the garbage men come to pick-up the trash, just moments later, our foursome neighborhood watch tears at the bags, wanting desperately to know what’s inside. Two of the guys even get into the back of the garbage truck to sift through the contents. This is the kind of ridiculous material that makes this movie more of a comedy than anything else. The next day, Ray and art decide to just go over there already and introduce themselves. They get all the way up the porch steps and to the front door, use the knocker and suddenly the momentum of banging it on the door causes a clock falls down. Suddenly a swarm of bees flies out of a hole in the house that was behind the clock. Ray and art go running off the porch, screaming for help, and getting hosed down by Rumsfield, who saw the whole thing. It’s another funny slapstick moment. Things get more mysterious in the second act, when Walter, the old man from the end of the street, goes missing. They find his dog outside by himself, but no Walter in sight. The guys even go to Walter’s house and find nobody home. They go inside and find his toupee on the kitchen counter. This leads them to wonder even more, thinking that the man would never leave his home without his toupee. It gets even worse when art shows up at Ray’s telling him that the dog dug up a femur bone. Just nights before, Ray saw the neighbors in their backyard at night, digging into the ground. This is a human bone they’ve now found. Clearly something is going on. To help keep the tone more comedic than scary in these scenes, we start seeing Ray’s wife restrict him from going out to hang with the other guys. There’s a great moment where Rumsfield and art come over wanting Ray to come out and practically beg his wife to let him leave. She refuses. This is meant to be like two kids begging their friend’s mom to let their friend come out and play. The scene works flawlessly. That leads us to the halfway point of the film, where the wives finally put their foot down and tell their husbands that they are all going over to the neighbor’s house, once and for all. This is a major departure from the first half, where we barely saw the neighbors at all. Now we are going full force, straight into their layer. The scene turns out to be deliciously awkward and strange. To call it uncomfortable would be putting it mildly. The final act of the movie involves the wives leaving for a day and the boys taking full advantage of that. On top of the wives being gone, the neighbors leave too, giving the team a chance to actually get into their house without anyone around. Things get very out of hand as the day turns into night and all hell breaks loose. The ending to this movie is packed with some great final twists about exactly what these neighbors were up to. This movie mostly works. Some of the comedy is sillier than it needs to be, but the story structure is in tact, and the pacing is spot on, elevating the stakes more and more as the film goes on.